Friday was full of fantastic firsts. One. Rocking up to SST (School of Science and Technology). Where children are groomed for greatness. Nurtured to become passionate innovators. Focused on applied learning. And able to connect the dots between classroom learning and the real-world. Two. Mingling with a 3M Manager and Mentor who said that his day job revolved around coffee, walkabouts and chatting! He shared of his inspiration – Tim Brown (CEO of IDEO), a world-renown practitioner. Who takes special interest in how design is used to promote the well-being of people. Three. Witnessing presentations by 13 year-olds at the SST-3M Innovation Challenge. Where remarkably simple solutions were designed to improve education, safety and mobility for the elderly. All thanks to 3M’s Innovator’s Toolkits, Manager Mentors and the sheer persistence of SST’s 200 participating students. Project Xtandle had my vote in this Challenge – with its pithy tagline (‘Never too high’) and ingenious prototype of retractable handle – perfect for shorter commuters to travel safely! But it was pipped by ‘The Study Book’ the winning prototype by team ‘Education 4lyfe’. They designed a lightweight storage box complete with chalkboard. A neat solution for students (especially in developing countries) who can use it as a learning tool and as a device to hold their materials. Kudos to team members Eugene, Natasha and Li Kai! Some of the other shortlisted presentations were a portable stairs support unit, modular house and multi-purpose portable learning aid. I was really impressed with the prototypes showcased in the exhibition room where SST Principal Hoe Wee Meng mentioned to me that the idea behind the Challenge was for students to come away from the Challenge – informed about what goes into designing solutions and inspired to make a difference. To me, Challenge judge Serene Goh (ST editor) perfectly summed up the spirit of the competition – as a refreshing one featuring ideas with a lot of heart – counter culture in a self-serving self-absorbed world – where the prototypes were all about people around us, “walking a mile in their shoes”. And you know what? You don’t need 3d-modelling software and laptops to innovate. Anyone can do it! Just ask Kelvin Doe! He taught himself engineering at 13 and built his own radio station. All this in Sierra Leone – a country where lights come on just once a week, and where Kelvin made his own battery to power the lights in people’s homes. Kelvin became the youngest person in history to be invited to the ‘Visiting Practitioner’s Program’ at MIT! Science Centre Singapore also champions the spirit of innovation through its STEM department which runs and promotes STEM-related programmes including its very own Shell STEM Youth Innovation Challenge 2015 which commenced on 1 January 2015 – inspiring creative solutions for the sustainability of food, water, energy and eco-friendly materials. 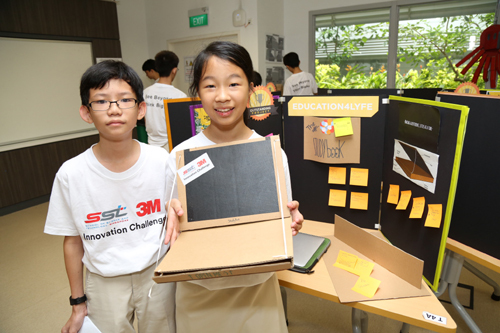 The SST-3M Innovation Challenge is SST’s response to the World Creativity and Innovation Week. Special thanks to Huntington Communications (Eugene and Marie); 3M (Manager-Mentor Pang Hoke Woei and Brand & Strategy Manager Jerilee); School of Science and Technology (Principal Hoe Wee Meng and Mohamed Irfan Darian). It really was a great event, which leaves you feeling really impressed by the thought, effort and time put in by each student. May there be many more future events like this for kids to grow! Yea, it was neat! Definitely hope to catch more of such events in future! Students these days have such amazing platforms, resources and mentors to create something meaningful! Nice post! Thanks for sharing about the events. I like the summary by Miss Serene Goh too! Thanks Kiat Teng! Serene was among other notable judges including Ms Chew Mok Lee (Asst Chief Executive for Entrepreneurship & Innovation in SPRING Singapore) and Ms Grace Choo (Head of Business Service Group and Brand & Strategy, 3M Singapore). They each had an encouraging word for the students at the end of the Challenge!